We present a large class of security protocol abstractions with the aim of improving the scope and efficiency of verification tools. We propose typed abstractions, which transform a term’s structure based on its type, and untyped abstractions, which remove atomic messages, variables, and redundant terms. Our theory improves on previous work by supporting a useful subclass of shallow subterm-convergent rewrite theories, user-defined types, and untyped variables to cover type flaw attacks. We prove soundness results for an expressive property language that includes secrecy and authentication. 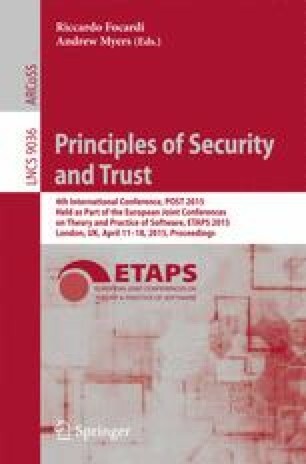 Applying our abstractions to realistic IETF protocol models, we achieve dramatic speedups and extend the scope of several modern security protocol analyzers.